The offered range of Champion Gasketis precisely designed keeping in mind the latest market trend and requirements of the clients. Champion Gasket, Thickness: 2mm, Size: 1"
The offered range of Champion Gasket is precisely designed keeping in mind the latest market trend and requirements of the clients. We Pratibha Enterprises offer 51 High Pressure Fiber Jointing Sheets to our client. By leveraging upon our huge industry experience, we provide the best quality array of Champion Gasket Sheet. 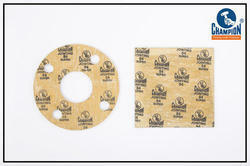 By utilizing our years of experience, we bring forth a qualitative array of Champion Metallic Gaskets. Usage: To make Packing Gaskets. champion asbestos rope, ptfe rope, gland packings.